Norgeston is an oral contraceptive pill. The tablets are known as the 'mini-pill' (containing only progestin). 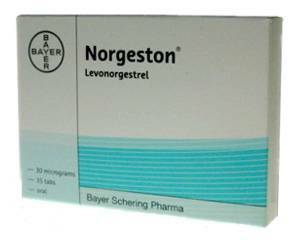 Norgeston contains the active ingredient Levonorgestrel. Levonorgestrel is a feminine synthetic progestogen hormone, which has approximately the same effect as progesterone. Both hormones play an important role in the fertility cycle. The active ingredient in Norgeston provides three ways to prevent pregnancy. It affects the production of natural cervical mucus. It increases the thickness of this mucus. Sperm will not be able to reach the uterus as well. The change in quality of the endometrial layer prevents implantation of a fertilized egg. In some women using Norgeston will cause the absence of the ovulation. You use Norgeston to prevent pregnancy. It is a one-phase pill, there will be no monthly bleedings anymore, but there may be occasional spontaneous bleedings. Once or twice a year is normal. You take the pill daily, in tablet form, without any intermissions, for 28 days. Norgeston comes in strips of 35 pills, each marked with a day of the week. Follow the direction of the arrows on the strip and start your next strip the day after the end of the previous strip. You start taking the pill on the first day of your menstrual cycle (first day of your period). Swallow each pill as a whole, with water if necessary, without chewing. Note: Take the pill everyday at the same time, inconsistent use may alter the contraceptive effect negatively. Healthy women who do not smoke virtually run no risk of serious side effects. Sometimes, however, some experience side effects. If these persists for longer than three months, it makes sense to contact a doctor. You may experience the following side effects after using Norgeston: breakthrough bleedings, change in vaginal discharge, nausea and vomiting. Norgeston will not protect against sexually transmitted diseases. It is important to ensure that Norgeston is the right contraception for you. Norgeston is suitable for most healthy young women, but it should not be taken when you are pregnant. Always read the leaflet before use.